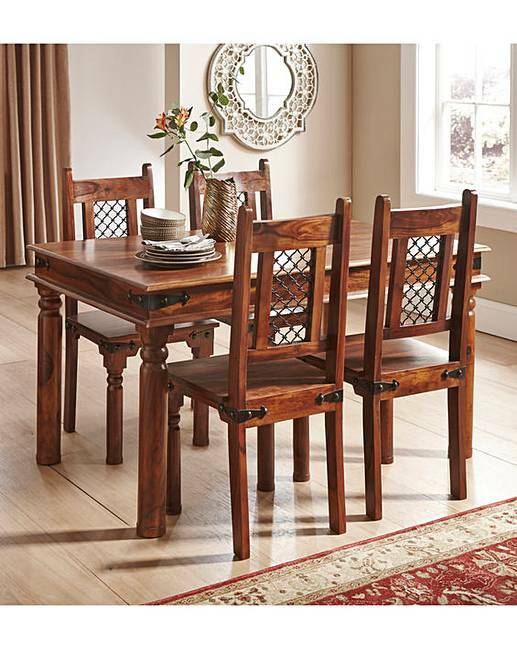 Jaipur Sheesham Dining Table & 4 Chairs is rated 4.5 out of 5 by 4. The Jaipur dining table and 4 chairs are crafted from solid sheesham wood with a stunning blend of light and dark colour tones, a natural wax lacquer finish and powder-coated iron mesh detail. Rated 3 out of 5 by nanatrish from Disappointed The wood is absolutely beautiful and the chairs are really nice. So wanted to give 5 stars however due to the legs not fitting the table top and having to order replacement and arrange another two days (one to deliver replacement and one to have the faulty one taken back) to sit and wait am not happy. The fact that this gorgeous wood and the chairs being OK I am prepared to accept a replacement. Just looked at other reviews and it seems this may be a recurring theme unless I got the one that the other customer returned! Rated 5 out of 5 by Divatrish from Solid wood, beautiful grain I bought this table and chair set to replace my old one, and I'm so glad I did. It is the most beautifully grained wood. Solid, not veneer. Very easily assembled. Looks great in my kitchen, but would definitely suit a dining room. Love it. 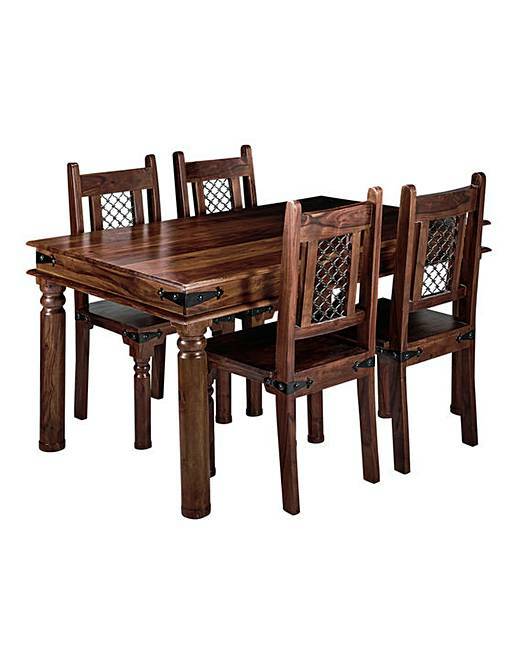 Rated 5 out of 5 by crusty79 from Lovely Set Lovely set of Dining furniture. Table chairs very solid, unfortunately one off the table legs was faulty as the holes did not match up. Rang customer service who was really helpful and they did offer me replacement of further discount if we wanted to keep the set we have got. The delivery off the item I would not give 5 stars, I have given feedback to customer services to pass on to delivery company. Rated 5 out of 5 by JM67 from Extremely well made furniture I am very pleased with this dining table and chairs. The wood is beautiful and very well made. It looks really nice in my home.